We have been asked a few times what the theme of Logan’s nursery will be, and we do not really have one. We I have a vision and I am hoping it all comes together in the end. Decorating is not really the Hubs thing, so he has been supportive and says whatever I want is fine and he will give an opinion when I show him stuff. A co-worker recently told me about zulily.com and I found these prints and they go with my vision so well! I just need to get them framed, and that is where I am stuck. I don’t know if I should do dark wood frames to match her crib, or go the less traditional route and have all the frames a different color. Decisions, decisions. 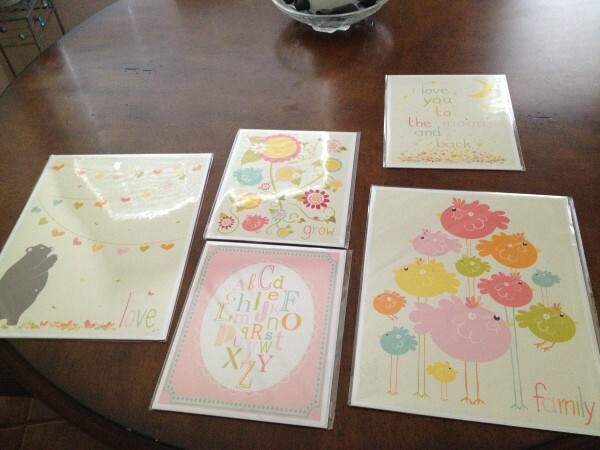 If it were me, I’d use the birds print as inspiration and paint each frame a bird’s color! I’m with Lindsey..I was going to say different bright colors, too.